Every business leader knows that strategic advantage is founded on a strong culture of organizational learning and growth. Strong cultures epitomize fair and equitable opportunity for employee stakeholders. Committed and ambitious employee acquisition and retention begins with compensation management. Application within a comprehensive and integrated software system enables HR organizations to fulfill their primary responsibility to the organization of delivering the best and the brightest at competitive rates. Strategic orientation anchors the HR development process. Strategy alignment begins with translating operational processes into the critical job descriptions required by the organization to achieve their objectives. 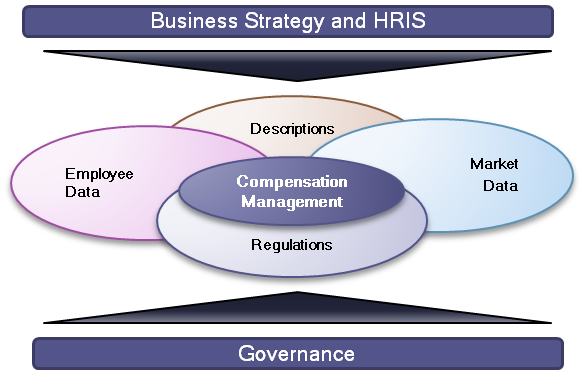 Compensation management data is fundamental information required by HR to complete key processes of organizational structuring, capacity planning and performance management, and therefore is the basis for any comprehensive and integrated HRIS.